It is the role of Strategic leaders to respond to change and external events, establishing a strong organizational structure, allocating resources and communicating strategic vision. As a strategic leader, your decisions may appear more risky, your actions more visible and achieving results more complex than for organizational managers. 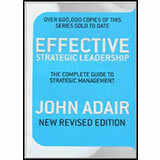 In Effective Strategic Leadership John Adair teaches you everything you need to know to enable you to be clear about what you want to achieve and to lead with purpose in order to turn your strategy into reality. Among other things, he shows you how to: Judge situations quickly and respond accordingly; Make decisions based on incomplete information; Pick the best second-tier leaders to achieve your objectives. 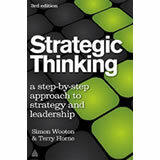 A Step-by-Step Approach to Strategy and Leadership, now in it’s third edition, takes you step by step through sound strategic thinking by setting out the questions to ask. In the process of answering these questions and thinking through the important issues that they raise, you will learn how to formulate strategies and write clear and concise strategic plans. Thinking strategically is what separates managers and leaders. Learn the fundamentals about how to create winning strategy and lead your team to deliver it. 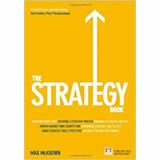 From understanding what strategy can do for you, through to creating a strategy and engaging others with strategy, this book offers practical guidance and expert tips. It is peppered with punchy, memorable examples from real leaders winning (and losing) with real world strategies. It can be read as a whole or you can dip into the easy-to-read, bite-size sections as and when you need to deal with a particular issue. The structure has been specially designed to make sections quick and easy to use — you’ll find yourself referring back to them again and again.